Footage from outside Dublin’s Convention Centre shows UK nationals joining the 3,000-strong crowd awaiting their citizenship ceremonies. In the first quarter of 2017, the number of British passport holders applying for the Irish counterpart has soared by 69 per cent, according to official figures. Speaking to the Irish Times, Yvonne and Bill Davidson said they were applying now because of Brexit. The pair, who have lived in Ireland for 27 years, said: “We talked about it and gave lip service to it, but then Brexit came along. Originally from Scotland, the couple said they wanted to remain a part of Europe, and Mr Davidson added the impact of the UK’s exit from the bloc could become more serious in the years to come. “If you think about it, potentially in two years’ time we might have to apply for a visa to go to France. David Rockingham said he was getting Irish citizenship now because of the decision to leave the EU. Meanwhile, Chris Randolph, originally from Gloucestershire, said the June referendum tipped the scales for him. He said: “Brexit tipped the balance. When I came here I wanted to be a European. 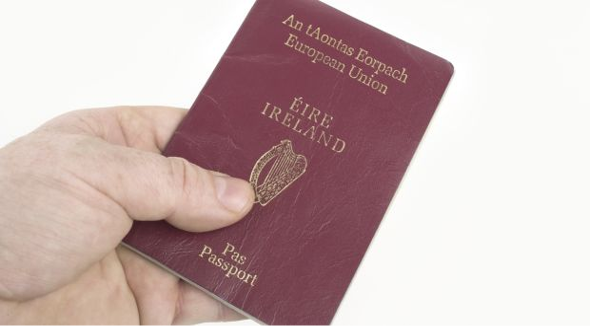 It comes as the number of Irish passports issued to Britons is predicted to reach one million by the end of 2017. Last year, 733,060 passports were issued, up nine per cent on 2015. About 65,000 of those were for Great Britain and Northern Ireland citizens. Foreign minister Charlie Flanagan believes people are trying to hold onto their citizenship in the European Union. He told the Guardian: “It’s reasonable to suggest that Brexit is a factor in what are record numbers of applications.